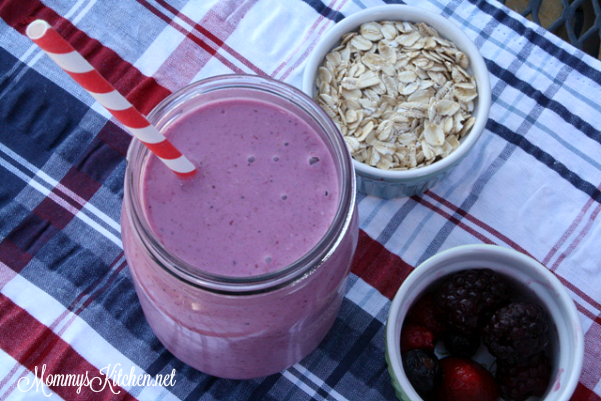 A delicious and creamy mixed berry and oat smoothie to start your day. Smoothies are a great way to get a nutritious on-the-go breakfast in no time. Smoothies are not just for breakfast, but also perfect to hold you over between meals or to satisfy a sweet craving. Getting my kids to eat healthy or consume the daily recommended allowance for fruits and vegetables has always been a challenge. My son, especially is very picky so adding fruits and vegetables to a smoothie is the one way I can get him to eat a few fruits and vegetables. One of our favorite smoothie varieties is the Green Monster Smoothie, it's packed full of bananas, almond milk, honey and spinach. My kids have no idea that it contains spinach, so we make them quite often because they taste just like a banana smoothie. My new local Walmart has a very appealing produce section. All of the fruits and vegetables are fresh, reasonably priced, and several of the items are even locally sourced. I love that I can shop in my local grocery store and help Texas farmers at the same time. With the low produce prices I'm always purchasing extra fruit and in season berries to freeze specifically to make smoothies. Recently I've been adding grains to my smoothies with great results. My regular fruit smoothies were pretty tasty, but with the addition of oatmeal and flax took my smoothies from good to being a hearty protein packed breakfast. Recently I tried this new Berry Blend Flax Smoothie from the Walmart circular and not only was it good, but it was also packed with healthy ingredients. We loved the smoothie so much that I made up a few freezer packs to have on hand. 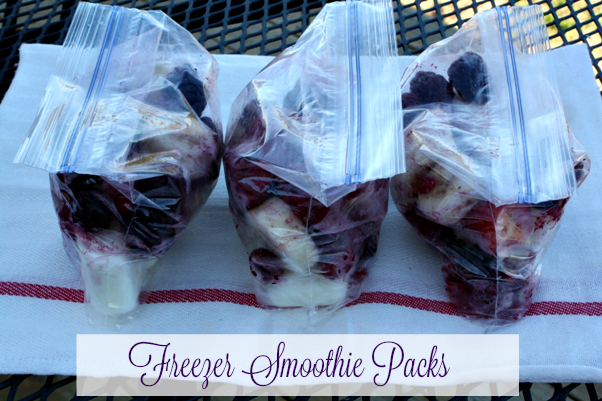 Making your own Freezer Smoothie Packs is simple and a great time-saver. Each smoothie pack is loaded with frozen berries, sliced bananas, frozen yogurt (measure and freeze in ice cube trays), ground flax seed and oatmeal, all the ingredients needed to make a no fuss berry blend smoothie. To build your own smoothie packs, combine 1 cup frozen fruit (I did mixed berries and 1/2 of a banana), 1/2 cup veggies (optional) 1/2 cup (4 cubes) frozen plain Greek yogurt, uncooked oatmeal and ground flax or Chia seed. Add everything except the liquid (milk of your choosing) to each zip lock packet. Using a sharpie label each packet and store in the freezer. Write how much liquid needs to be added (1 cup milk) on each smoothie pack. To use the smoothie packs, add one cup almond, soy, coconut or regular milk to a blender. Add the entire contents on one smoothie pack and blend until smooth. 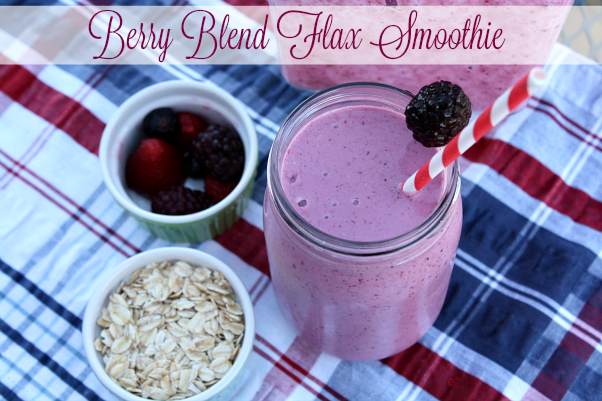 Ingredients needed for Berry Blend Flax Smoothie: Regular milk, vanilla almond milk, coconut or soy milk. Frozen berries (fresh if in season), 1/2 of a banana, plain whole milk Greek yogurt, unprepared oatmeal and ground flax seed. I prefer to use whole milk (full fat) Greek yogurt to make smoothies. I always have it on hand for baking and it's a wonderful substitution for sour cream. Whole milk Greek yogurt typically has twice the amount of fat than regular yogurt, but it's also a great source of calcium, low in sugar and high in protein. Most smoothie recipes call for a 1/2 cup of yogurt, so that's roughly 90 calories, 4 grams of fat, and 10 grams of protein which goes a long way in staying fuller longer. If you're watching your caloric intake use low or non fat Greek yogurt in place of whole milk yogurt. Place all the ingredients in a blender or magic bullet. Blend until smooth. Pour into a glass and enjoy. One teaspoon raw honey can also be added as a sweetener. 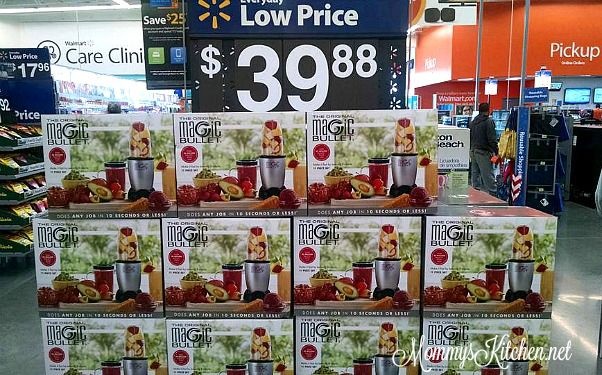 I have a Blendtec Blender, but if you're looking for a smoothie maker the Magic Bullet drink blender is a great choice and currently on sale at Walmart. For more smoothie recipes, visit Walmart.com Smoothie page. We love smoothies as well. If I can't get my son or teenage daughter to eat breakfast I can at least make a smoothie before they head off to school. Having the freezer packs are really helpful, especially on busy mornings.